We turn yard work into artwork. From ponds, to lighting, to general landscaping we help make your backyard dream come true. We are professional, certified outdoor project experts that specialize in creating backyard ecosystems. Our team of pond experts can design, maintain or repair all types of water features. From ponds, waterfalls, fountains and streams we offer a variety of services that can be customized to suit your specific needs. 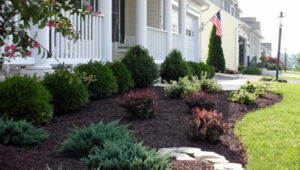 Our professional design team can help you from start to finish with ALL your landscape needs. When it comes to lawn care needs our certified trained technicians can help you. 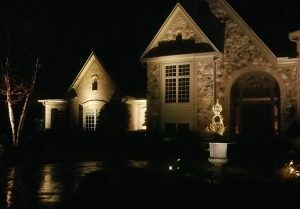 Outdoor lighting can help illuminate your house to your landscape to extend the time you can enjoy paradise. From start to finish we partner with you to bring your backyard dream to life and leave with an ecosystem worthy to share. To help us better consult with you, send us photos and an idea of what services or products you looking for! Once we’ve received your inquiry and photos we’ll be in touch as quickly as possible to discuss options and create a project plan with you. If more explanation is needed we’ll schedule an in-person visit (*a consultation fee may apply in some instances*). At this stage we work with you to design your outdoor space the way you want it and then we schedule a time that is best for you to build! Once the work is complete, we share a keepsake with you: a collection of video, before and after photos for your to share with friends and family. Damascus Enterprises, Inc. was established in 1998. 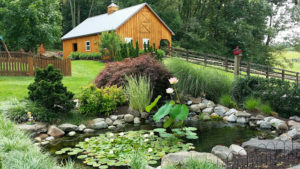 The business has continued to grow and expand over the years offering a full array of services that now include pond and waterfalls installation and maintenance, lawn care, landscape design, custom stonework, and outdoor lighting. We are Certified Pond Installers and have partnerships with leading manufacturers. We continually further our experience and knowledge by attending industry workshops and trainings. We know that any project from large to small can be stressful for the client. We do our best to eliminate any additional stress by being on time, prepared, and professional. While working with us and after, we want our customers to enjoy the experience of designing and enjoying their new outdoor paradise. Ready to get started designing your backyard ecosystem? “I also want to commend your crews. They were incredible, hard-working and seemed to enjoy what they were doing which is so important. I love our gardens and Pat and I are very pleased with the overall look of the yard now. It was of particular concern to finish the property line as the house behind us, which has been vacant for 3 years has been sold. We now have a beautiful vista from our patio and a clearly defined edge which will provide privacy and beauty. “We recently had Damascus Enterprises do a significant amount of landscaping work for us. This work was done when promised and on time, in spite of rainy weather one of the days. They removed dead and dying shrubbery and replaced with new stock. They also laid paving stones in an area that was constantly wet and soggy. At each step of the operation Mike make sure the location of the plants and pavers were where we wanted them. Day two, in the rain, they laid sod, put in an underground pipe from a down spout and edged, weeded and mulched all of our flower beds. When finished, they cleaned up and hauled debris away. You wouldn’t know they had been here except for the great looking beds with new mulch, the new pavers and new sod. “Your crew left a few minutes ago. I was worried when you arrived this morning that it was going to be a long, difficult project due to the hot mess the yard had become. Particularly with the explosion of weeds we had after all of that rain. The crew worked hard and did a fantastic job! The yard looks much, MUCH better! We are grateful and look forward to not cringing every time we go outside and see it. A yard that’s meant to be shared. We believe the process of bringing your outdoor space to life should be as fulfilling as enjoying your finished, new outdoor space. Your yard is meant to be shared! On completion of your project we give you a small collection of photos from the build, finished shots and when possible a time lapse video for you to share with friends and family. And we’re always a call away to help you maintain your yard, year after year.